Home › Lift Truck Reviews › Introducing – Forklift Friday! 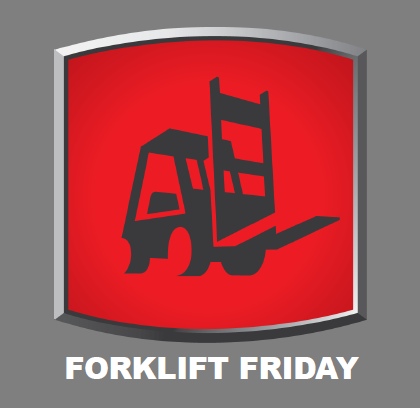 Starting today, every Friday we will be showcasing a forklift from our inventory for what will be known as, “Forklift Friday”. The purpose of Forklift Friday is to display some of the premier brand used forklifts we carry in our large inventory. We will post pictures, detailed reports, related forklift information, and recent news regarding manufacturers. In addition, we will provide video presentation of our forklifts and industrial machines when necessary, or upon request. If you have any questions or would like to see a specific forklift from our inventory, feel free to contact us at sales@ohweo.com or +1 216-264-6540. 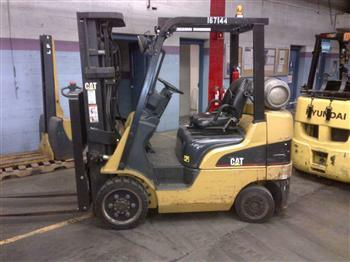 Description: Used Caterpillar C5000 IC Cushion Forklift. This forklift has a three stage mast with 188″ lift height and 83″ overall lowered height. Great used forklift. Condition: Small cut in seat; Rubber on floor mat slightly worn; Small dents in side panel and hood; Drive/steer tires in good condition; Operation and safety inspection is good; Engine compartment and hydraulics/mast is good. Visit Caterpillar’s Lift Truck website to learn more about Caterpillar Forklifts.